Stitchy Minds Think Alike: Spring has sprung? Not where I live. Spring has sprung? Not where I live. 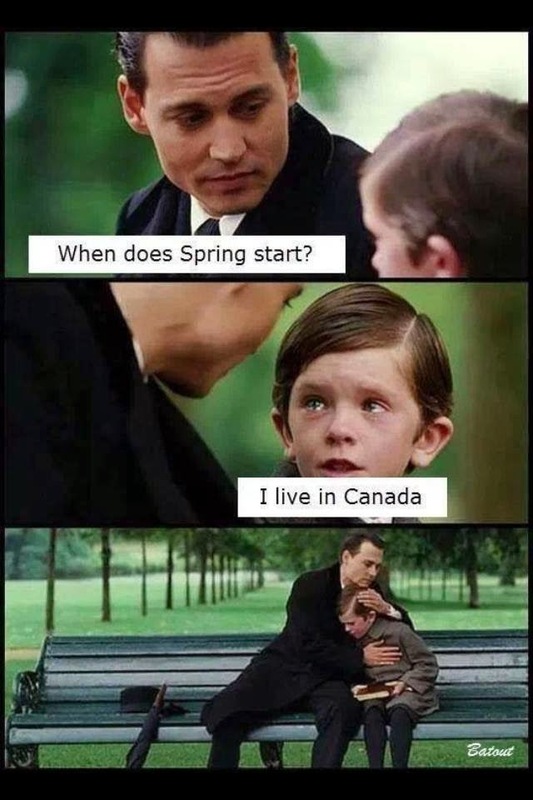 Happy First Day of Spring? Of course 03/20/2014 marks the official start of Spring but here in Moncton, New Brunswick, Canada we are getting more weather coming. It has been a long one. Feels like forever since we wore short sleeves and sandals. Bad weather often means good stitching though. I have made a lot of progress this month and have a finish to share! This is Pamela Kellogg's 2003 Mystery Autumn Sampler. I call it the Bella Project. 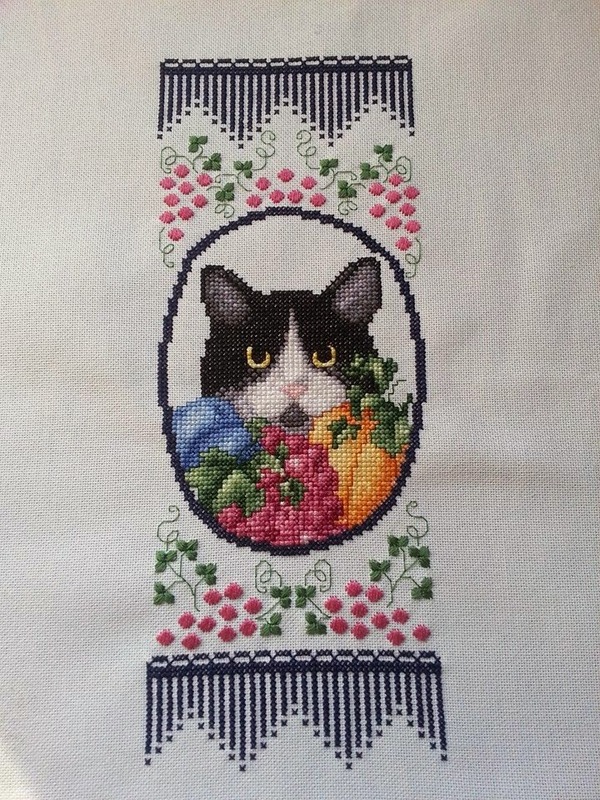 I am going to have it finished as a little wall hanging. Sewing isn't my strong suit, but I know a couple of really talented gals that can help me out! 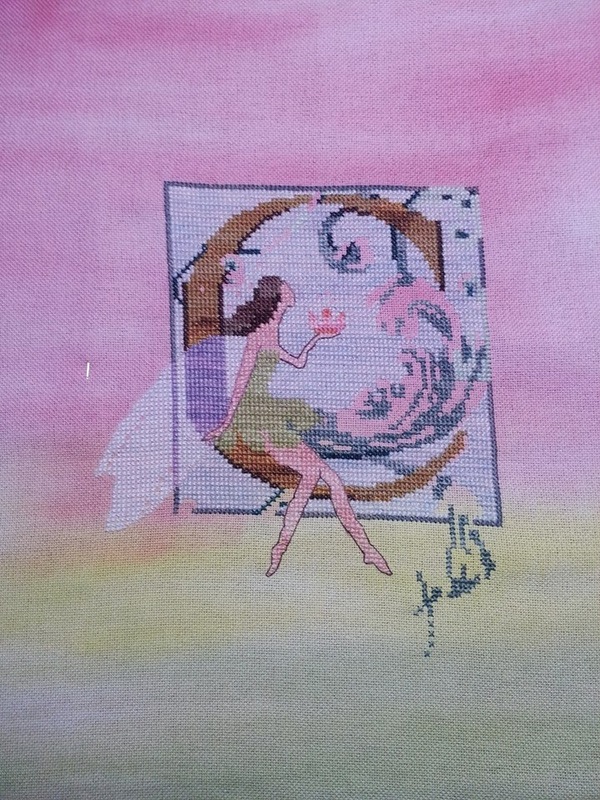 Used DMC 823 for the border instead of suggested Gold Kreinik. I love how it turned out! This looks so much like my Bella! I changed the pattern eye colour from green to yellow to match my cat. I loved doing these little stitches. They were fun and are absolutely adorable! I also got the fourth instalment of Frosty Forest! I am loving working on this series so much. 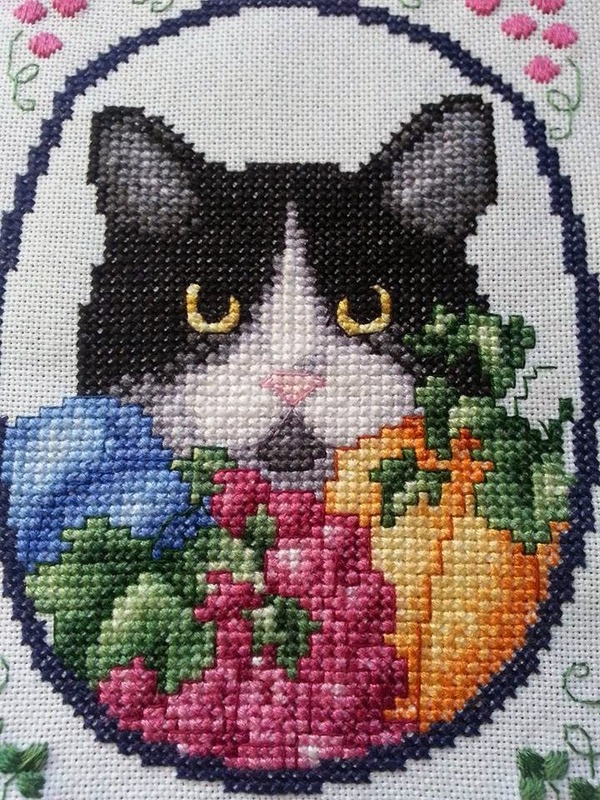 I got the pattern Wednesday, stitched the border Thursday and binge stitched Friday and Saturday until I was done the block. It is adorable. 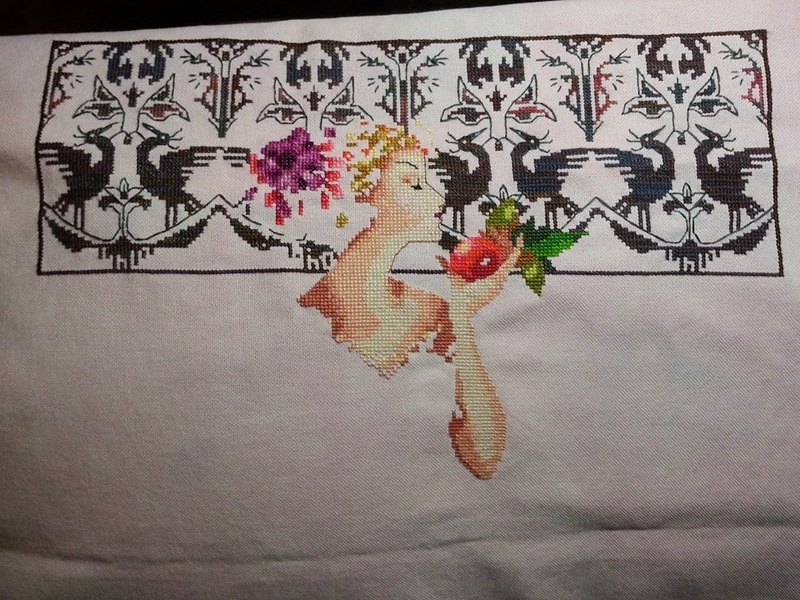 I can't wait to get my next pattern from Colours by Lalena. 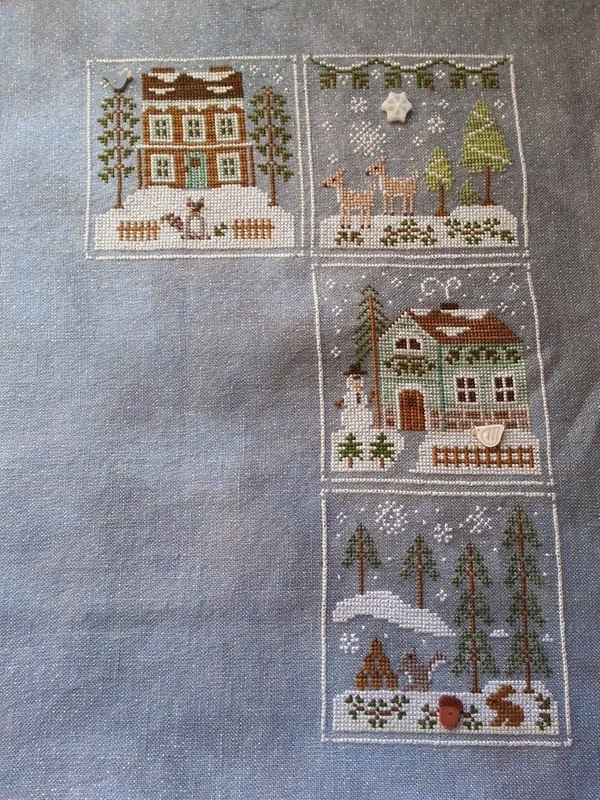 Frosty Forest by Country Cottage Needleworks stitched on 32 count Foggy Morning Opal linen by Crafty Kitten. 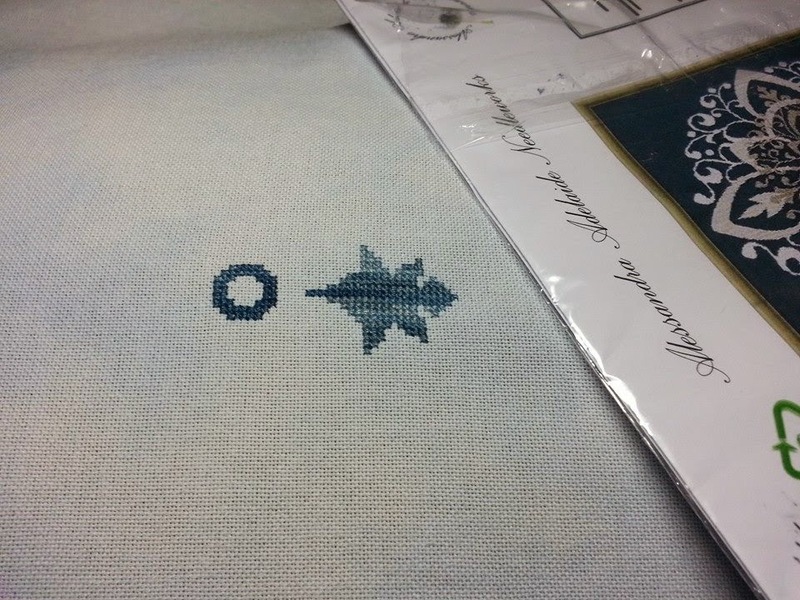 I started a new one.... Arabesco by Alessandra Adelaide Needleworks (AAN). I'm excited to be working on this one. I chose to use a combination of Polar Ice Waterlillies by Caron and DMC 930 and 932 on Under the Sea's Ice Princess. I only have put about an hour into this so far...but I must show and tell! So I still have lots to work on. I am looking forward to continuing work on my WIPs and getting my Rosewood Manor Autumn Sampler in the mail soon. I ordered a fantastic piece of fabric for it from Leslie at Under the Sea. I can't wait to show you the floss toss! Enjoy your first day of Spring everyone! Thanks for stopping by! Oh, Bella turned out sooooooooo pretty! Great progress on ALL of your projects. Can't wait to see more of Persephone, it's gorgeous. Frost Forest is coming along nicely. 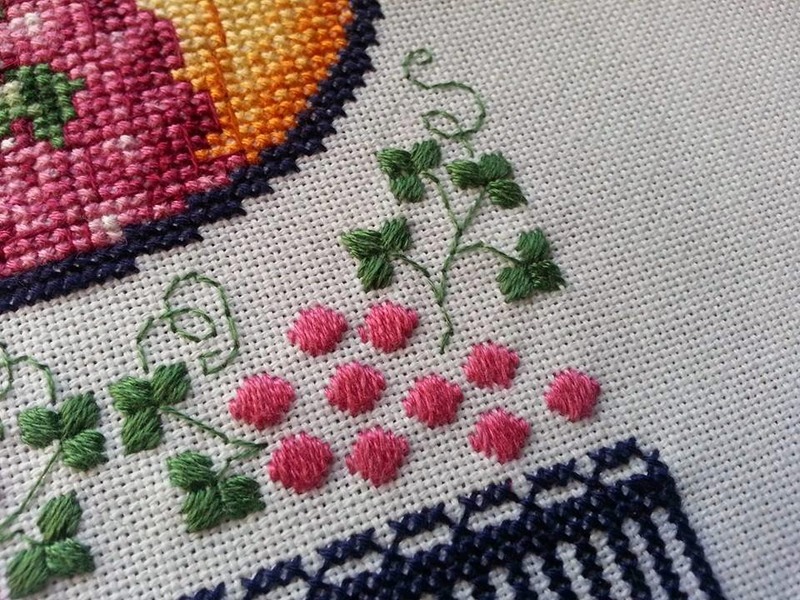 Lovely stitching and LOVE the idea of binge stitching. So much healthier for you than binge anything else!